Our annual bbq lunch meeting is January 21st at C&J bbq in Bryan (location is 1010 south texas ave). Time is from 11am to 1pm. Large meeting room has been reserved. Several business items to be discussed and voted on. Also since a quorum was not met at the December meeting, officer elections could not be held thus will be done at this meeting. Membership payments will also be taken for the 2017 year. Cost is $15 for individuals or $20 for family memberships. Forms will be made avail. This is one of our more popular events so be sure to come and bring your family and friends as all are invited! My plan is to arrive between 5:30-6:00PM. There is 5$ (cash) admission to the lake but with the stub on the bottom of you windshield tag you receive $5 off your order. There is no cover if you leave before 8:00pm or pay the cover and stay, the band this week is Texas Unlimited. It looks like the weather is going to cooperate and it should be mild and dry. Plan is to get seats on the patio and try to enjoy the atmosphere, and watch the sun set over the lake. The club will be having its Fall time Radio In The Park event October the 15th following the BARC club meeting. Time starts at approx 12 pm until 4pm. Bring your portable radio gear & antennas and come out and operate and have some fun doing so. Power (120v ac) will be made available. Food and drink is not provided so bring your own. You may wish to bring a chair. All are invited to come out, members, non members, guests, families and those just curious about amateur radio and want to learn more or see communications in action and/or portable radio setups. If weather is not favorable for this outdoor event then the next Sat (22nd) is the make up day.. The Bryan Amateur Radio club will be participating in the annual Texas Qso Party Sept 24th and 25th 2016. Contest runs from 9am-9pm Sat and 9am-3pm Sun local time. Location will be at W5VUI/KF5HUY and KF5LPT’s house in Bryan. Go to Events Calendar to pull up map for actual location. Food (fajitas) will be served but drinks are BYO. Coolers & ice provided. We will also have tv avail to watch the Aggie football game Sat night. We will have 2-3 hf radios set up for all who want to contest. Ares Comm Van will be out there to operate out of, as well as a table setup outside (under cover). If you have your own favorite rig you want to use then bring it. Even if you’re not into contesting come on out anyway for fun, food and fellowship, even if its just for an hour or two or during the game. We’d love to have you! BARC is having its quarterly social dinner night out this Friday the 29th at Koppe Bridge Bar & Grill on Harvey road. Meet up time starts 6/6:30pm but come when you can. Everyone is invited, members, non members, family members, new hams, etc. Address is 3940 Harvey Road. About a mile east of Hwy 6 bypass on Hwy 30/Harvey Rd. FOOD! FUN! RAFFLES! RADIOS! PEOPLE! Come see what is happening in your Community! This Saturday, June 25th 1pm – Sunday, June 26th 1pm (at Brian Bachman Park in College Station) is the ARRL Field Day 2016! 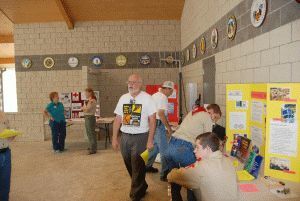 Come out and see all that Amateur Radio has to offer. Talk to the Amateur Operators from the Brazos Valley, and listen to radio communications from around the United States and beyond! Do you have a question you have always wanted to know, or are just curious about how to obtain your Amateur Radio License? Then this is the perfect time to get your questions answered! Have you been studying for your first license exam, or want to test for an upgrade? Come on down then at 3:30 pm in the Pavilion area and test at our hosted VE session. One lucky person who passes their Technician’s exam will win a Baofeng handheld amateur radio! There will be a BBQ dinner at 6pm (tickets are $10 available at the event). You do not want to miss out on all the fantastic food that will be available! There will also be a raffle with prizes for everybody! Tickets are $5 for 1 ticket, $25 for 7 tickets, $50 for 15 tickets, and $100 for 30 tickets plus 1 yr of W5BCS membership. Interested in Obtaining Your Amateur Radio (HAM) License? To obtain your license you would study for, and then take, your Technician’s license exam, which consists of 35 questions. The Bryan Amateur Radio Club (BARC) will be administering our next exam at our Field Day event on June 25th, 2016 at 3:30pm at Brian Bachman Park (in the pavilion area). The fee to take the exam is $15. There are also study resources are also available for a fee, such as www.hamtestonline.com. You can purchase study materials from the ARRL (American Radio Relay League) at http://www.arrl.org/shop/Beginners/.